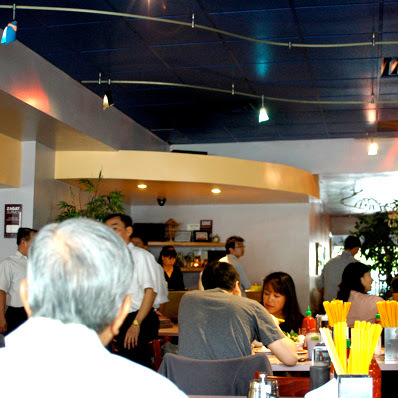 When you do ask anyone where the best pho in SGV is served, you're likely to get 4 different replies. 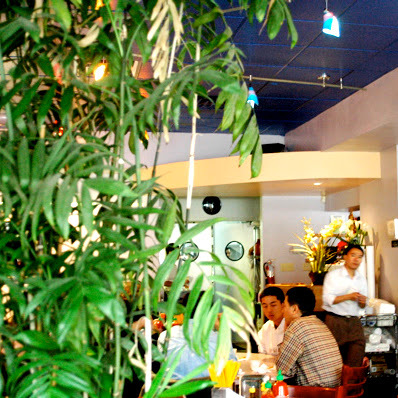 Golden Deli, Saigon Flavor, Vietnam House and Pho 79. But actually, it's 2 different choices since the first three are family-owned. So we'll just say Golden Deli and Pho 79. When you ask why those two on forums like Chowhound, you'll hear two types of responses. Golden Deli - good egg rolls and overall food. Pho 79, less crowded and very good pho. And I couldn't agree more. I like the plants here, makes me feel like I'm in Southeast Asia. Here you can see that the waiter spotted me behind the brush. We played peek-a-boo for about 30 seconds then it got old. 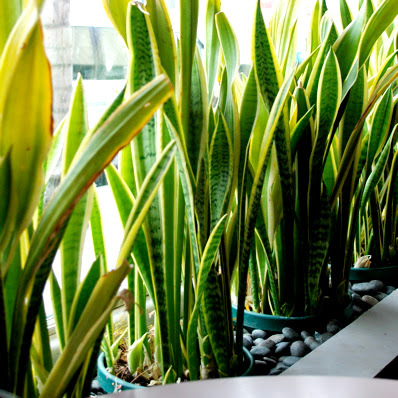 My friend and I got a window seat next to another species of plants only found in Pho 79. I felt like I was in a fish tank. For foodbloggers, window seats are the best b/c we get the maximum amount of natural light. On this day, there was an overcast. Boo. I call the employees here the entourage because there are a good 16-20 employees floating around. And they are dressed like civilians. Many times I've waved at someone I thought was an employee and got a weird look. Beware, the waiters disguises themselves... like us. One bad thing about Pho 79 is the unattentive service. You really have to get their attention by getting all of your friends to do 'the wave' like you're at a baseball game. And don't even bother asking for the check, just go to the counter and pay. They know their table numbers very well. 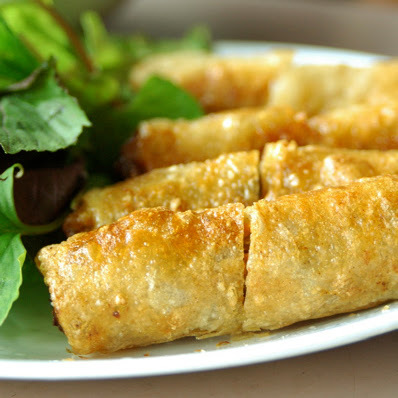 The 2nd place award for egg rolls IMO goes to Pho 79. 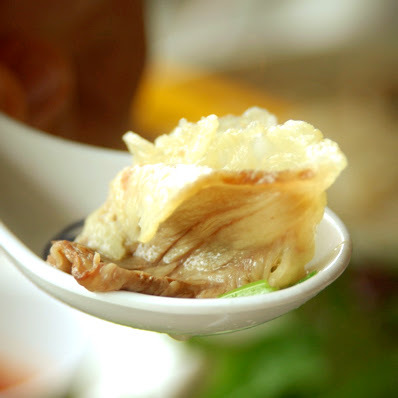 They use the right kind of wrapping, rice paper, and fry it perfectly. My friend felt it was too chewy, a sign of not being fried long enough, and prefers Golden Deli's. For me, this is a plus because I love things with texture. These are very good! For me this is the advantage Pho 79 and places like Pho Super Bowl have over Golden Deli... the golden brisket. Beautifully tender brisket with a golden lining of tendon. It almost looks like beef bacon. 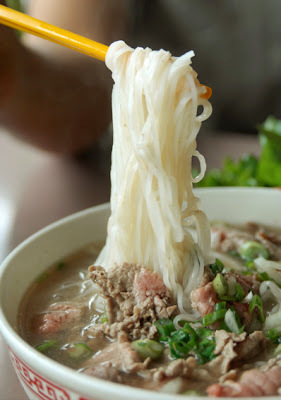 As for the pho, the broth color is not as beautiful as Golden Deli's and sometimes appears cloudier. Reason being... they don't clean out the impurities of broth well enough. 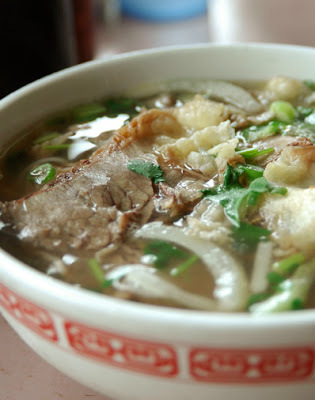 A good bowl of pho has a nice clear brown color and no 'floaties'. The broth was also somewhat warm even before I had put in the bean sprouts. But still, a very tasty bowl of pho. I guess you can call this the royal piece of beef. I am drooling as I type. My friend's bowl of pho. He ordered the rare steak pho and as you can see, the blood has already started to pour out into the soup, making the already-cloudy soup even cloudier. 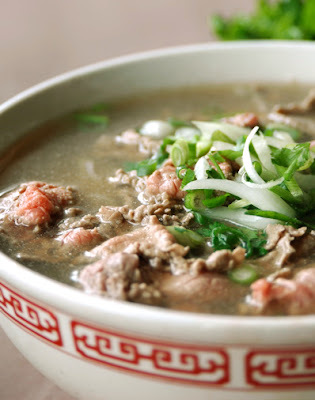 A note for those that order Pho Tai - you can ask for them to put the rare beef on the side. I've seen some people dip it like fondue, separating the pho from the beef the whole time. 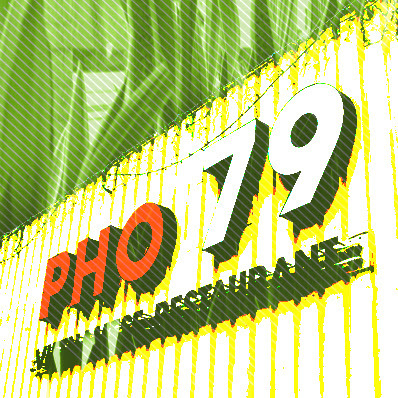 Overall, Pho 79 is very good. I think they are neck and neck with Golden Deli, and only slightly behind because of the cloudy broth, less-tasty cha gio and warm soup. Ask others and I'm sure you'll witness a husband-wife argument over Golden Deli and Pho 79.